Boston Training Update 1/23 and Homemade Granola! I did take down my mileage last week, and I miiiiiight this week (probably not). I have been keeping my feet up as much as possible, NFL has made this SO easy the past two weekends…we’ll see what happens this weekend with NO football..I don’t know what I’m going to do without it. Compressing….my CEP compression socks have never gotten so much wear! I wear yoga pants to work most days (I know, lucky me) and I can just wear them under and no one even has to know! And I have been trying to stretch my calves as much as humanly possible, using this piece of equipment at work that can only be described as torture. Finally, and I think this is the most significant change – I have not run on sidewalks/concrete in the past two weeks. I have been running on trails, rubber tracks, and around Duke’s East Campus. If we’re being honest, every day I do less and less icing, elevating and compressing. The better my shins feel and the less swollen my feet are the less I do. Yikes. If you see me, nag me, please. Until this point, my Boston training had been going really well! My track workouts are obviously always better when done with friends and I am surprising myself by being able to hold pace in my tempo runs. I have yet to get any REALLY long runs in (nothing over 14 yet) but I really like my training plan (running 6-10 miles 6 days a week). I have been taking my warm up/cool downs from just 1 mile each to 2-3, which I never thought I’d willingly do. So overall, lots of positives. Another positive side effect of marathon training – I am starving 24/7. We had our first “real” snow scare earlier this week in the Triangle area..sooo obviously I went to the grocery store and decided to make granola. Thank goodness not everyone in Raleigh drinks Almond Milk…unlike regular milk there was plenty in stock. 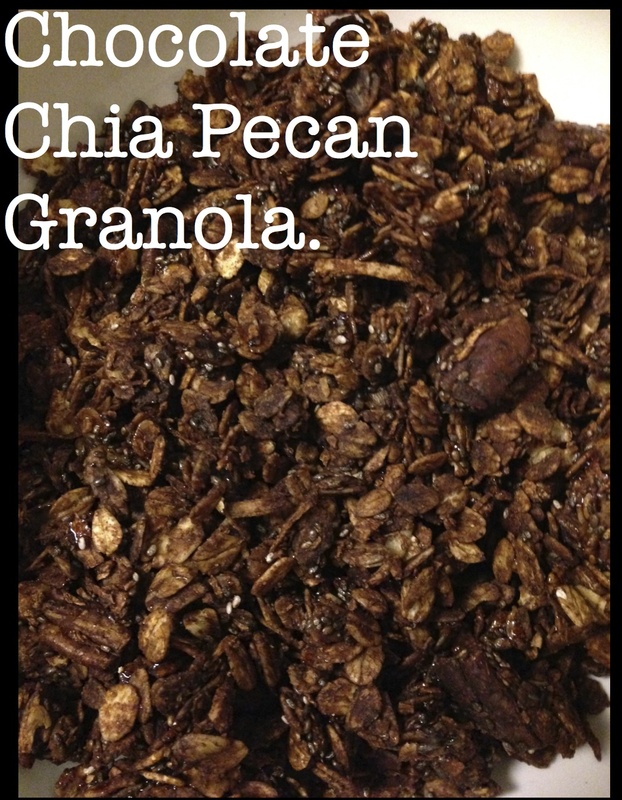 My granola was Chocolate, Pecan, Coconut, Chia seed granola… and it was DELICIOUS. I got the idea for my granola from this recipe. I had almost everything I needed, except I was somehow out of oats and shredded coconut. I made mine with agave (I definitely used more than was suggested), chia seeds, pecans, and light brown sugar. I didn’t even add any chocolate pieces to it after it was done, it was sweet/chocolaty enough for me. While it was cooking in the oven my apartment smelled heavenly. The recipe makes 7 cups…I ate it all by myself in three days. Previous Post 2013 Recap: A Year That Asked Questions. Next Post Boston here I come?! You are so lucky you get to run mid morning, is that on your work break? I can only run very early in the morning or very late at night. That granola looks really good.. I’m also pretty much starving 24/7 and not even training for a marathon yet!